Plans to test a super-efficient plasma space drive aboard the International Space Station (ISS) have been confirmed. The Ad Astra Rocket Company, which is developing the Variable Specific Impulse Magnetoplasma Rocket (VASIMR), has announced the signing of an agreement for the tests with NASA. The deal was inked on December 8 by Ad Astra chief and former astronaut Dr Franklin Chang Díaz, and for NASA by space-ops honcho William Gerstenmaier. Upon the successful achievement of the milestones set forth in the agreement, NASA and Ad Astra envision that VASIMR™ will be launched to the ISS where the rocket can be tested, for the first time, in its intended environment: the vacuum of outer space. The primary technical objective of the project is to operate the VASIMR™ VF-200 engine at power levels up to 200 kW. Engine operation will be restricted to pulses of up to 10 minutes at this power level. 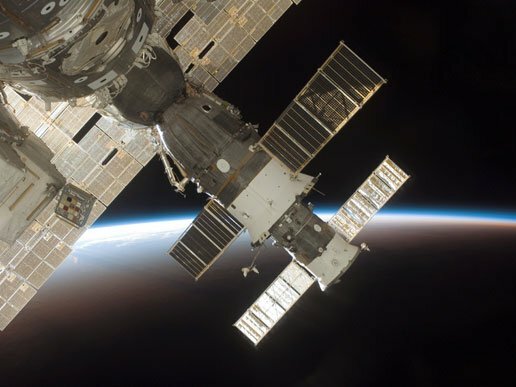 Energy for these high-power operations will be provided by a battery system trickle-charged by the ISS power system. The VASIMR works by ejecting plasma reaction mass at extremely high velocities, much higher than a normal chemical rocket can achieve by spitting out combusting fuel. This means that a given amount of reaction mass does hugely more work, which could allow Moon ships to carry more cargo or interplanetary voyages to be made much more quickly. The VASIMR isn't any use for launching a spacecraft into orbit, however, as its thrust-to-weight ratio is far too low. The planned VF-200 for the ISS, for instance, would generate a trifle less than the push exerted by a weight of one pound in Earth-surface gravity. However, it requires very little fuel to maintain this thrust for a long time, meaning that it can be used to prevent the ISS' orbit decaying without the need to ferry up big loads of rocket fuel. Of course, unlike a chemical rocket a plasma drive needs electricity. In the case of the ISS, this will come from the station's solar panels. Solar-powered VASIMR ships, according to Ad Astra, could move cargoes to the Moon much more efficiently, or perform other missions at Earth orbit or closer to the Sun.